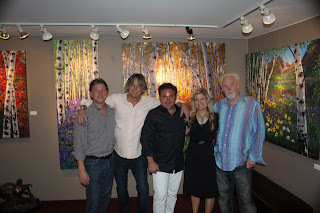 Minnesota Collectors visit my Home Studio! 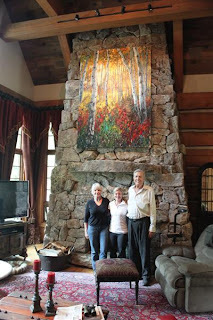 Kim Harrison has been collecting my art for nearly a decade. 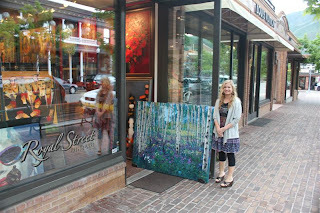 She had originally discovered my work online and ended up purchasing one of my very first Giclees. Over the years, she has steadily added to her collection. I was thrilled to get an email from Kim telling me she was planning a family vacation to Southern Oregon and wanted to stop by the studio to meet me. It's not often I get collectors passing through my small town...so I jumped at the opportunity. 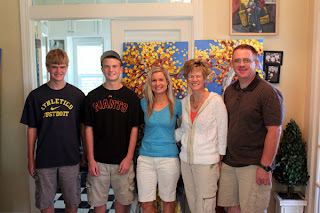 It was so much fun meeting Kim and Kelly and their two boys, Trevor and Ben and giving them the studio tour. 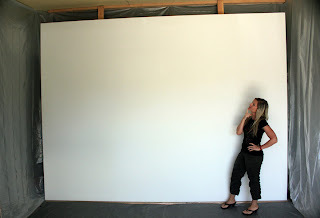 My studio is not a fancy or large space, I must admit...but it works! I always have a collection of paintings in progress lining the hallways and strewn throughout the house. People often marvel that my 4 children (ages 11,9,7 and 5) never seem to harm the artwork that surrounds them. My kids are used to it, I tell them. They've grown up with paintings in the house since they were infants! 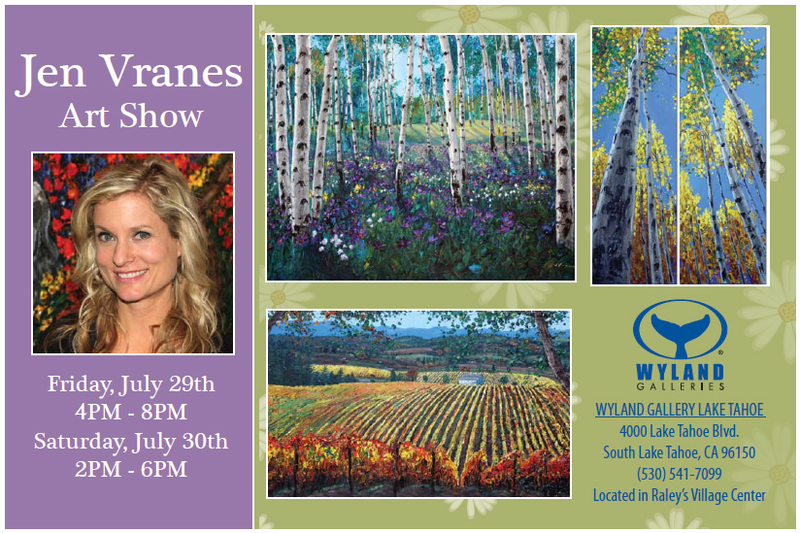 Show at Wyland Galleries in Lake Tahoe! Royal Street Gallery likes to put my freshest painting right by the front door, to attract passing visitors. It seems to work! 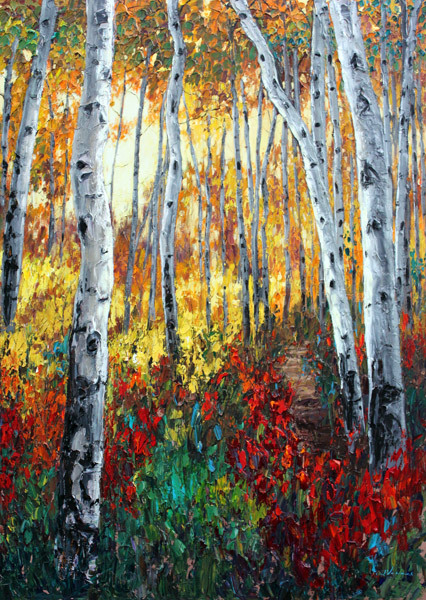 A client saw this painting and immediately fell in love! They decided to go to lunch to think about it...and when they came back, someone else had purchased it! They were devastated. They hadn't been gone more than an hour! 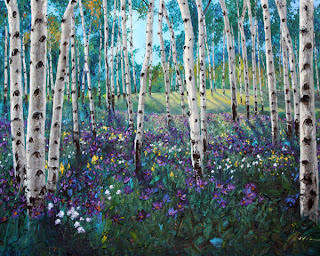 They ended up commissioning me to paint them a similar "Spring" piece. 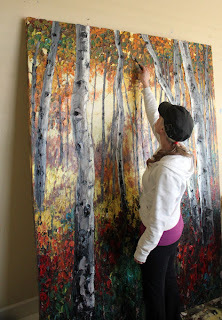 Adding the final touches to Aspen Twilight in the studio. I'm standing on a step stool! 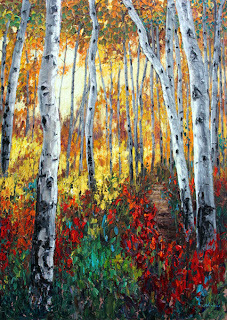 Aspen Twilight, thick acrylic on canvas, 84" x 60"
The canvas is all stretched and ready to go! Wow. This thing is HUGE! I can't wait to get started. This truly is my dream painting. Wish me luck! 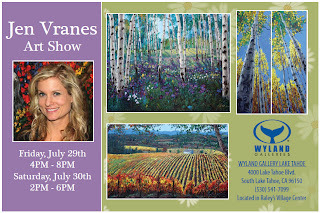 Every year in July--at the height of the tourist season, Royal Aspen Gallery hosts a show for me. I always look forward to it every year. 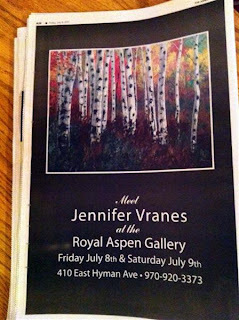 I love just being in this upscale town and hanging out with the guys at Royal Aspen. These boys can really sell my work! 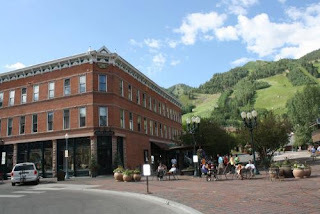 July is a great time to come to Aspen. 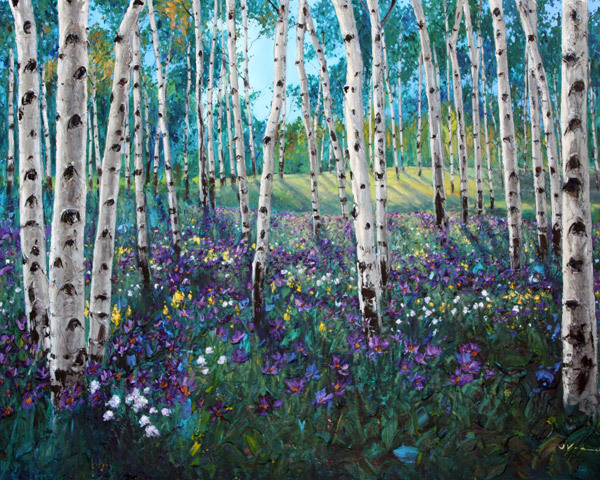 The show is in the evenings, so I like to spend the days hiking and taking pictures of the gorgeous mountains and... of course...aspen trees! I literally take thousands of pictures. I always get super excited to get back to the studio to start my next series! Just being here inspires me. We stayed at the Independence Square Hotel. 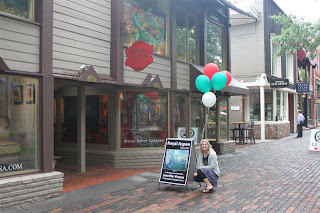 The location was perfect--right in the middle of town, about a block south of the Gallery. Everything was in walking distance. 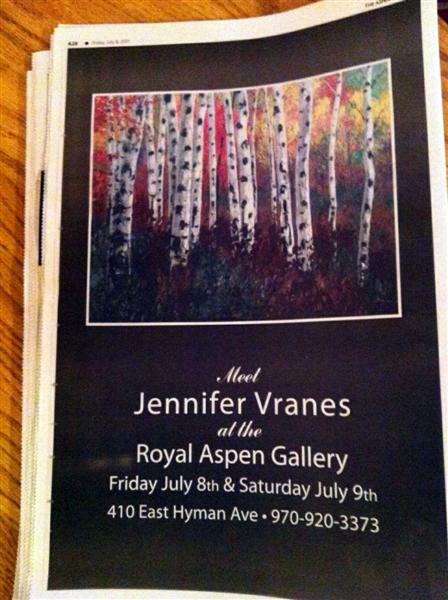 We opened the Aspen Times this morning and saw a full-page Announcement for the Show! The Gallery looks great! 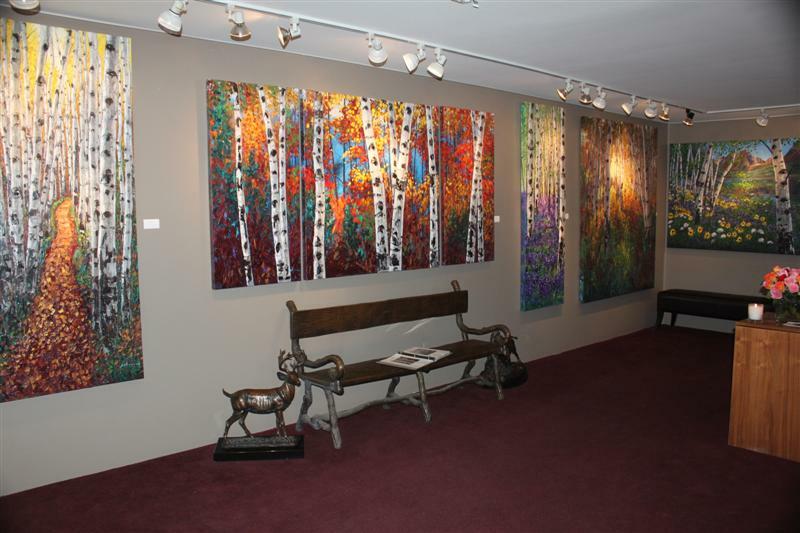 I love how they arranged my paintings. I sent them 7 new paintings for the show...and they arrived just in time. 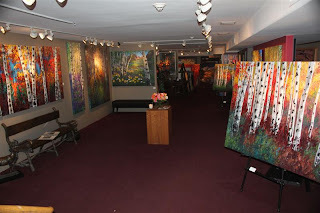 This Gallery does best with my large pieces....so most of the work is 4 feet and above. They especially like the 7 foot to 8 foot range! The show was very successful! I couldn't have asked for a better group of reps. 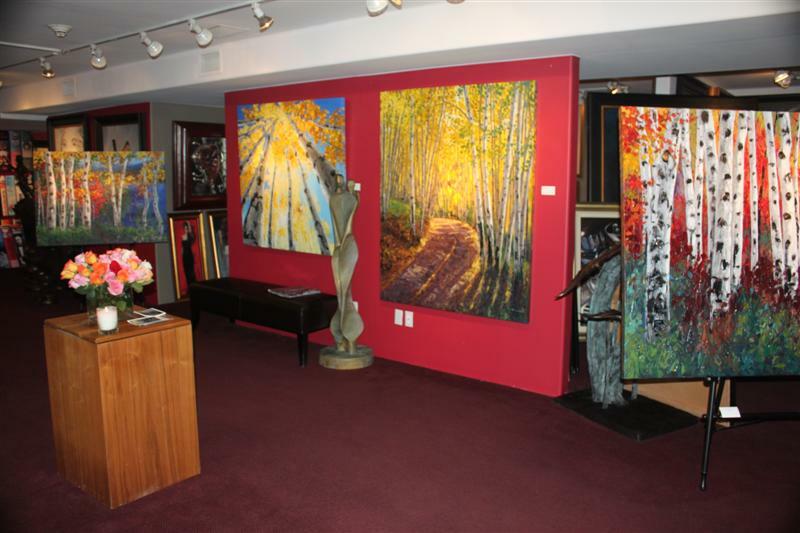 They really know the art business and are super passionate about my work. It was fun re-connecting with them in person again. These guys sell a lot of paintings for me, so I try to keep them well stocked with my best (and biggest) art.